Մայայի երազը, Բհարհութ, մ.թ.ա. 150թ. 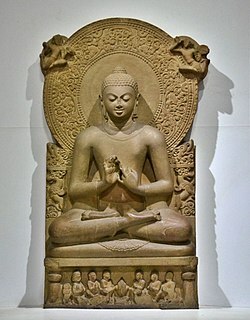 "...as is now almost universally accepted by informed Indological scholarship, a re-examination of early Buddhist historical material, [...], necessitates a redating of the Buddha's death to between 411 and 400 BCE..."
Around 400: See the consensus in the essays by leading scholars in Narain, Awadh Kishore, ed։ (2003), The Date of the Historical Śākyamuni Buddha, New Delhi: BR Publishing, ISBN 81-7646-353-1 . ↑ 4,0 4,1 4,2 According to the Buddhist tradition, following the Nidanakatha, the introductory to the Jataka tales, the stories of the former lives of the Buddha, Gautama was born in Lumbini, present-day Nepal. In the mid-3rd century BCE the Emperor Ashoka determined that Lumbini was Gautama's birthplace and thus installed a pillar there with the inscription: "...this is where the Buddha, sage of the Śākyas (Śākyamuni), was born." ↑ According to Geoffrey Samuel, the Buddha was born as a Kshatriya, in a moderate Vedic culture at the central Ganges Plain area, where the shramana-traditions developed. 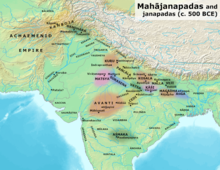 This area had a moderate Vedic culture, where the Kshatriyas were the highest varna, in contrast to the Brahmanic ideology ofKuru-Panchala, where the Brahmins had become the highest varna. Both the Vedic culture and the shramana tradition contributed to the emergence of the so-called "Hindu-synthesis" around the start of the Common Era. ↑ Muller, F. Max. (2001) The Dhammapada And Sutta-nipata, Routledge (UK). p. xlvii. 0-7007-1548-7. ↑ 70,0 70,1 Anålayo, The Buddha and Omniscience, Indian International Journal of Buddhist Studies, 2006, vol. 7 pp. 1–20.